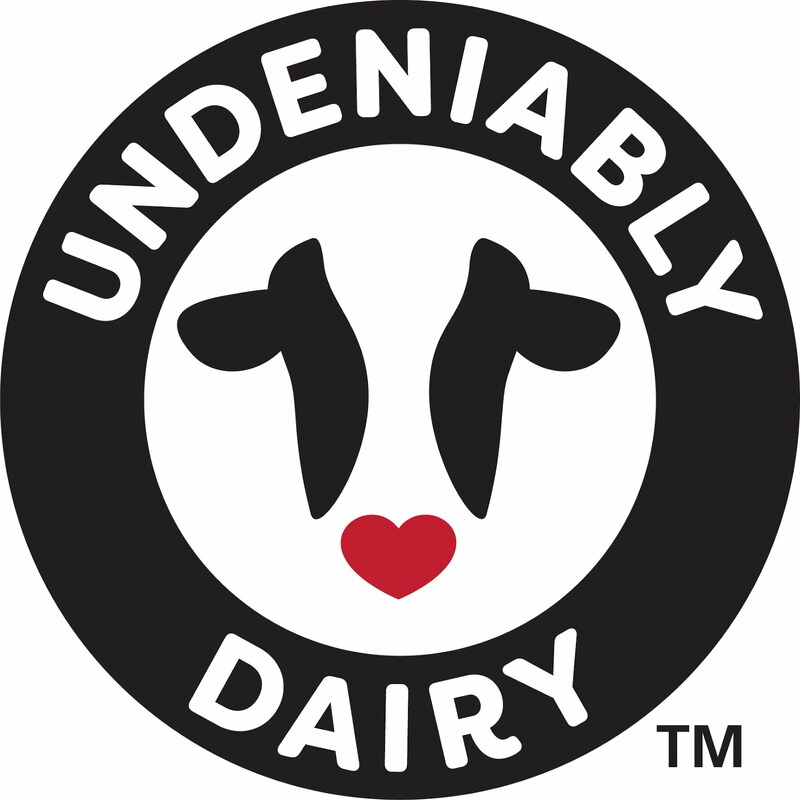 As a dairy farmer, I've witnessed the birth of countless calves. 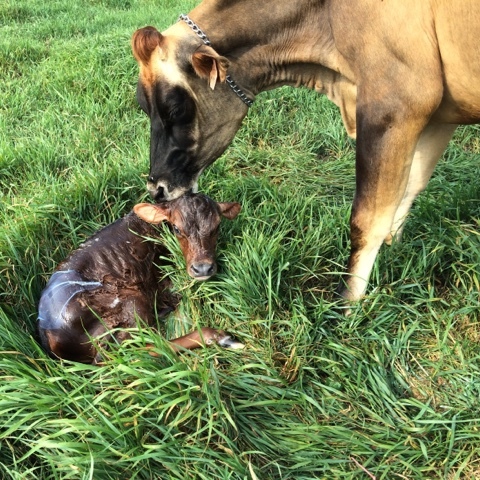 Most of our cows deliver their calves without assistance, but every once in a while a cow needs some help from us. I realize, though, that most people have never watched the birth of a calf. How is a calf born? The photos below show how it happens. Birth really is a miracle and it's always amazing to watch. The cow in the photos is Lily. I happened to be checking on our ladies in waiting one morning when I saw that Lily was about to give birth. I took out my phone, turned on the camera, and stood back. 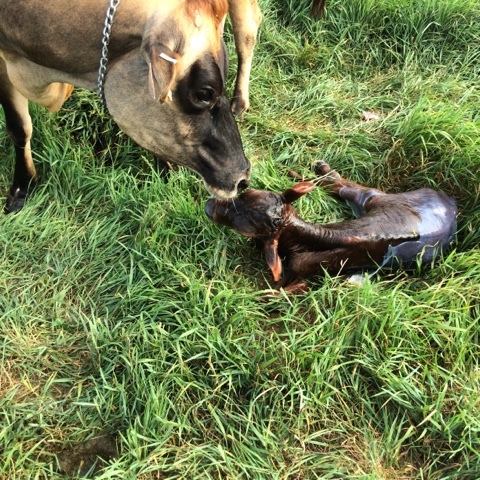 Lily delivered her calf like a pro, so I just watched. 9:13 a.m. – Lily is about to give birth. The calf's front feet are present. 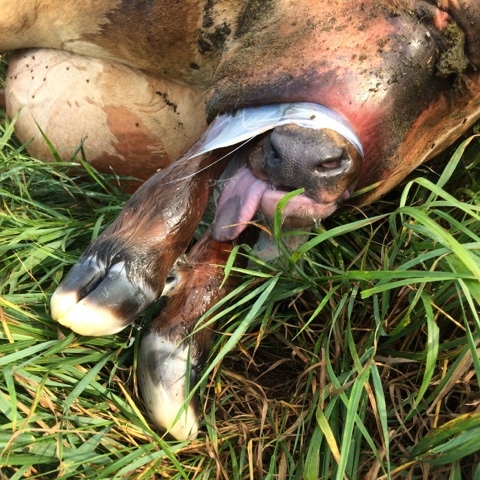 You can also see the thick mucus that Lily's body produced to help the calf slide through the birth canal. Up until this point, Lily was likely standing up and laying down a lot to help position the calf for birth. Other signs that a cow is soon to give birth include standing or walking around with her tail lifted and distancing herself from the rest of the herd. Most, but not all, cows prefer solitude when giving birth. 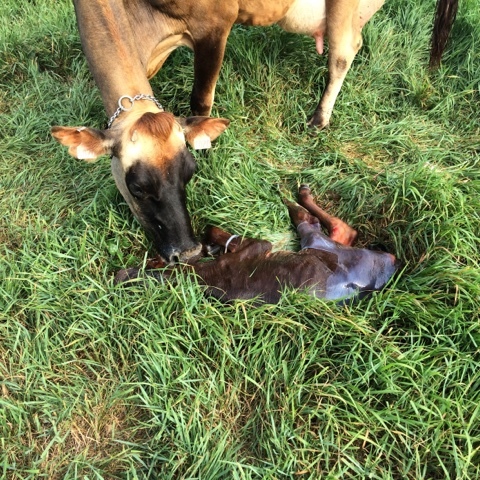 9:17 a.m. – Lily has laid down (most cows give birth laying on their side). The calf's nose has emerged. The calf will usually stay in this position for several minutes as the birth canal finishes dilating from the pressure of the calf's head. For cows giving birth the first time, the calf might stay in this position for an hour or more. At this point, the umbilical cord is still supporting the calf's life. 9:18 a.m. – Lily has pushed the calf out a couple more inches. Cows have contractions every couple minutes and instinctively push with each contraction during the final stages of birth. You can clearly see the white cushiony pads on the calf's hooves in the photo above. These pads protect the inside of the cow and prevent the calf from puncturing the amniotic sac. The pads will wear off quickly once the calf starts walking. 9:22 a.m. – The calf's head is out. At this point, it was really hard for me not to grab onto the calf's front legs and pull the calf out the rest of the way. 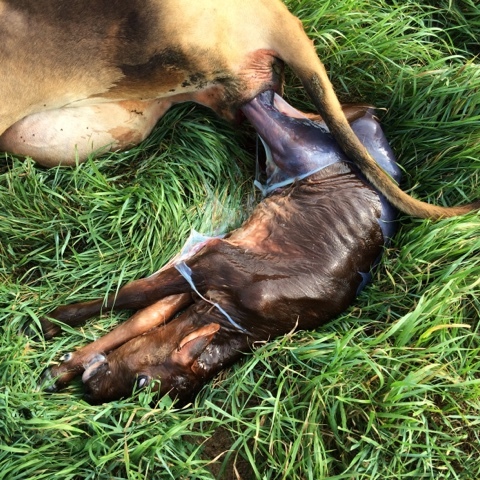 Once the calf's head has emerged, the blood supply to the umbilical cord is pinched off by the birth canal, so it is critical for a calf to be delivered quickly once it reaches this stage. 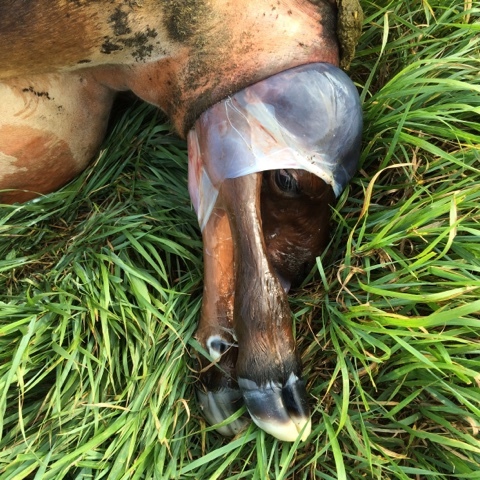 The white membrane around the calf's head in the photo above is the amniotic sac. 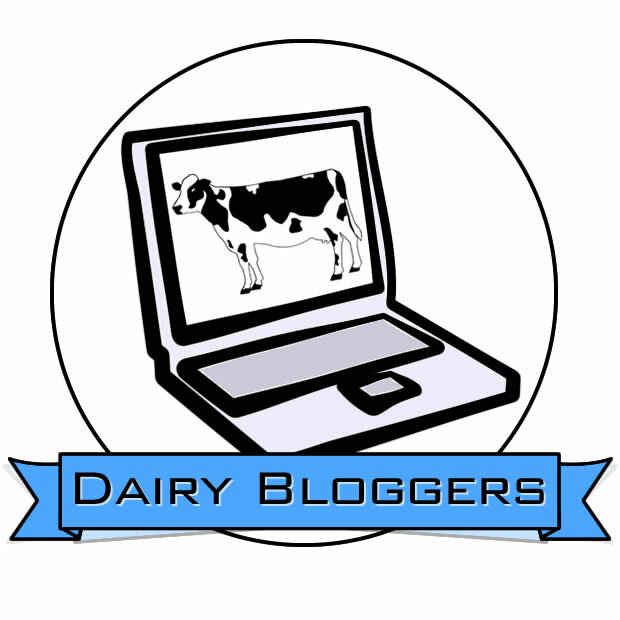 9:22 a.m. – One final push and the calf is (mostly) born. Lily didn't need any help from me; there were only a few seconds between the last two pushes. The calf has already taken its first breath. If you look closely at the calf's mouth, you can see the bubble that formed when it exhaled. 9:23 a.m. – Lily hopped right up to check on her calf, who is already trying to sit up. Truth be told, some cows lay there for a couple minutes to rest before getting up to tend to their calves. 9:23 a.m. – Lily starts vigorously licking her bull calf. 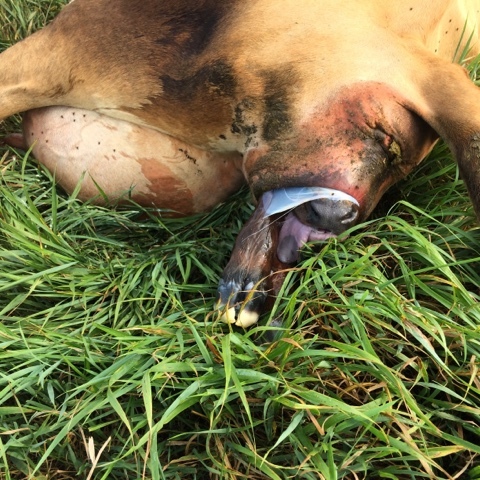 Her sandpapery tongue removes the amniotic fluid covering the calf, which will help the calf dry off more quickly, and stimulates the calf's circulatory and respiratory systems. Licking the calf off might sound gross to humans, but it's important for both the calf and the cow. Analgesic opiates (natural pain relievers) are released by the cow's body when she gives birth; ingesting the amniotic fluid makes those pain relievers more effective. In fact, most cows, after their "water breaks", will slurp up the puddle of fluid. 9:25 a.m. – Lily's calf is alert and sitting upright. Lily will continue licking him while he practices standing up (as seen in the short video below). Within an hour (or less), Lily's calf will be standing. Our kids, like all farm kids, have been watching the birth of calves since they were little. One day a couple of years ago, I listened from the kitchen while Monika and her cousin were playing midwife in the living room. After her cousin waddled around with a babydoll under her shirt for awhile, it was time for the baby to be born. I heard Monika say, "No, the baby comes out like this." I peeked around the corner to see Monika demonstrating. 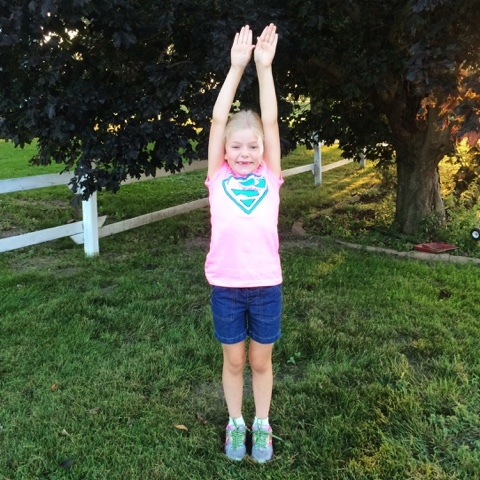 She was standing there like Super Woman with her arms over her head. 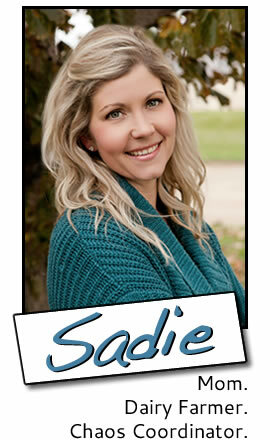 She assumed that human babies were born the same way calves were born – hands first (or front legs first). I didn't correct her. Someday she'll discover that, despite all the similarities between mammalian species, there are some differences.